As seen in the movie Beverly Hills Chihuahua, this fully lined harness dress has cute lime green and pink stripes, embroidered matching flowers and a lace trimmed collar. Matching visor & Lead are included and it has a sturdy D-ring for easy lead attachment. 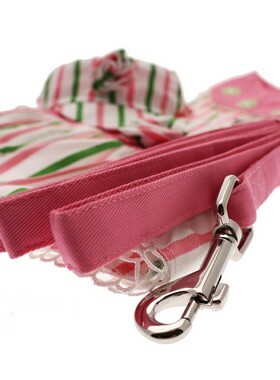 It was worn by the star of the movie 'Chloe' the White Chihuahua and can be seen on her in the early part of the movie.